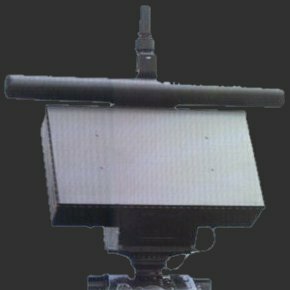 The TRS-3D is a naval multimode 3-D radar for surveillance and weapon assignments, an advanced addition to the G-Band radar family and ideally suited for the light combatants providing excellent range for small RCS targets. 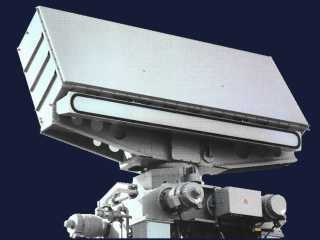 The multimode TRS-3D radar uses a phased array antenna in a 3-D multimode for simultaneous detection and tracking of multiple targets and employs electronic stabilization to neutralize the rolling motion of boats operating in choppy coastal waters, with specific operational modes to protect against sea-skimming cruise missiles and attack helicopters. The radar antenna is made up of a planar phased array pencil-beam array of 16 or 32 rows of 46 radiators each. Electronic phase shifters are incorporated for scanning in elevation. The antenna includes polarization agile or linear polarized radiators. It is in successful service with the Royal Danish Navy on the Standard Flex 300 patrol boats and has been also provided for a sensor upgrade on the Niels Juel class corvettes. Figure 1 shows the TRS-3D/16 antenna assembly with stabilized platform. The antennagroup comprises the G-Band primary radar antenna an integrated IFF antenna (both covered by a radome) and an optional I- Band navigation radar antenna. Figure 2 shows the more powerful version of the TRS-3D/32 that is used as the main self defense radar on corvettes and frigates such as the German F 122 frigates.